I had the pleasure of meeting with Jessica Cross yesterday. An incredibly bright marketer, an account based marketing visionary and Director of Marketing at FlipTop. The vision of using advanced analytics and predictive technologies to inform account targeting is brilliant! Without effective selection, all the downstream benefits to ABM wither away. This is, well, mandatory. From yesteryear, I see images of myself and my teams wetting a finger and sticking it into the air… this, the selection process for finding target accounts for sales and field marketing. Been there, done that! Fast forward to today, marketing and sales executives can now harness the power of advanced analytics to make and monitor account selection decisions. 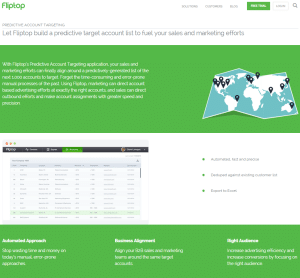 I look forward to engaging more with FlipTop in our effort to better define, validate and promote account based marketing strategies!